This week’s minorities in cartoons entry is “Jayson,” a comic strip by Jeff Krell. “Jayson” debuted as a comic strip in 1983. It features the adventures of its star character, a gay man dealing with his off-and-on dating life. Rounding out the main cast is their neighbor, a flamboyant adult entertainment producer named Robyn Rickets. Jayson considers Robyn a friend, while Arena’s often on less-than-friendly terms with Robyn. Also occasionally appearing is Jayson’s ex-boyfriend, Walter. Over the course of its run in the 80s and 90s, the strip appeared in several major LGBT comic and newspaper publications of the day. Eventually, the strip ended its syndicated run. In the 2000s, Krell revived the strip via reprint collections, as well as graphic novels and other comics featuring the cast. 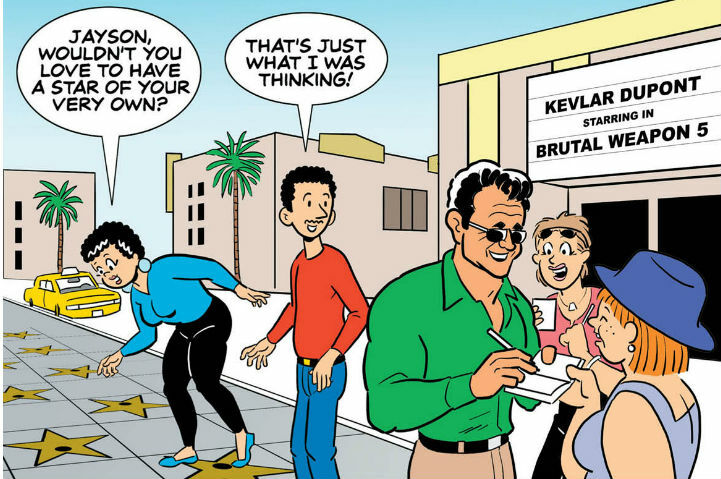 The most prominent of the newer strips is probably the graphic novel “Jayson Goes to Hollywood.” Krell also turned the strip into an off-Broadway play in the late 90s. If wondering, Krell’s cited being a fan of Archie Comics, with its art style clearly an influence on his strip’s look. Of course, like “A Couple of Guys” and “Kyle’s Bed & Breakfast,” “Jayson”‘s humor is definitely more adult.